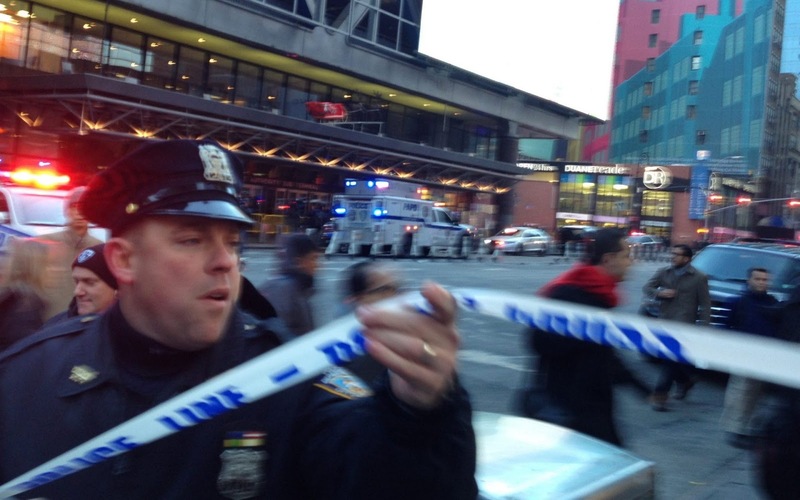 A man has been arrested in New York following an explosion near to a bus station in Manhattan. No one other than the suspect was hurt by the blast close to Port Authority Bus Terminal near Times Square, said authorities. The explosion took place between 42nd Street and 8th Avenue, New York Police Department (NYPD) said on its main Twitter account. "One male suspect is in custody," it added. "No injuries other than suspect at this time. Avoid the area. Subways bypassing #PortAuthority and Times Square Stations. Sources told ABC News the arrested man was aged in his 20s and had been badly injured. White House Press Secretary Sarah Sanders said President Donald Trump "has been briefed on the explosion in New York City". The New York Mayor's Office said Mayor Bill de Blasio had also been briefed, adding police and fire crews were on the scene. Andre Rodriguez, 62, told the New York Times that he heard an explosion shortly before 7.30am. He added: "I was going through the turnstile. It sounded like an explosion, and everybody started running." Alicja Wlodkowski, 51, was eating at a nearby restaurant when the blast went off.